The Goldbach conjecture states that every even integer ≥ 4 can be written as a sum of two prime numbers. It is known to be true up to 4 × 1011. In this paper, new experiments on a Cray C916 supercomputer and on an SGI compute server with 18 R10000 CPUs are described, which extend this bound to 1014. Two consequences are that (1) under the assumption of the Generalized Riemann hypothesis, every odd number ≥7 can be written as a sum of three prime numbers, and (2) under the assumption of the Riemann hypothesis, every even positive integer can be written as a sum of at most four prime numbers. In addition, we have verified the Goldbach conjecture for all the even numbers in the intervals [105i , 105i +108], for i=3, 4,..., 20 and [1010i , 1010i + 109], for i=20,21,..., 30. A heuristic model is given which predicts the average number of steps needed to verify the Goldbach conjecture on a given interval. Our experimental results are in good agreement with this prediction. This adds to the evidence of the truth of the Goldbach conjecture. 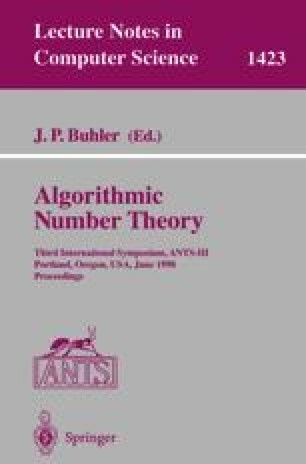 To appear in the Proceedings of the Algorithmic Number Theory Symposium III (Reed College, Portland, Oregon, USA, June 21–25, 1998).